Participants in Lexus' online movie take the wheel of a CT 200h. LOS ANGELES -- Lexus' small CT 200h hybrid won't go on sale until February, but a short online movie called Dark Ride is already promoting the vehicle and reaching out to younger buyers. Lexus and its ad agency, Skinny, aim to generate excitement among consumers 16 to 44 -- known as Gen XY. That demographic is a far cry from the median age of Lexus' owners -- 57. The movie is interactive, with online participants commanding the wheel of a CT 200h. The mission is to prevent the opposition from stealing the car's hybrid technology while driving safely to Los Angeles. The driver makes the decisions. 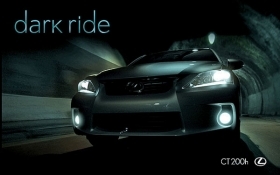 The movie trailer began running on lexusdarkride.com on March 31. The movie debuted on lexus.com on May 14. "This is the longest pre-launch we've ever had," says Lynda Eguchi, marketing strategy and life cycle manager for Lexus. "This will be the new gateway for getting to Gen XY. We want to move them into the Lexus family." The CT 200h, the smallest Lexus, arrives in February. At 170.1 inches long, the CT 200h will be the smallest Lexus. The front-wheel-drive car is powered by a 1.8-liter inline-four engine. "This allows us to market the car and reach out to consumers in a different way," Eguchi says. "It is one way of being totally immersed in the car without having the car. "You can feel the driving experience. You can customize it, have your voice in the film with pictures, your own dialogue. You choose which direction you want the film to go." Hand-raisers also can get an exclusive Dark Ride card that allows them to participate in various offers and events. Test drives of the vehicle will begin this fall. Eguchi would not say what the cost of the pre-launch is and says it's too early to measure the success of the movie. But, she says, Lexus is learning how to talk to Gen XY. "They're more media-savvy, more online," Eguchi says. "We will be capturing a big part of this crowd."